Perion is the town where a beginner class can become a warrior. 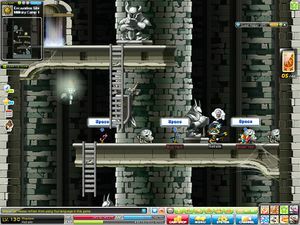 Players must be level 10 to make the advancement to warrior. The town is located at the north of Victoria Island. Perion is surrounded by strong monsters, in particular a few areas called the Burnt Land, featuring several maps of Boars and Iron Pigs. It features a rocky setting with canyon-like surroundings. 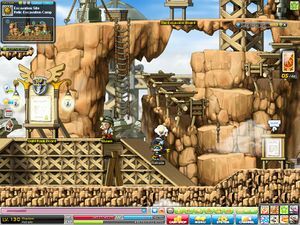 Like Ellinia, it is a vertical map which can make navigation difficult. Some of the buildings actually appear to be caves directly in the rock walls. 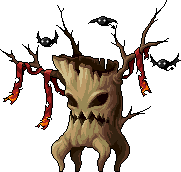 The boss of Perion is Stumpy, a giant Stump monster and presumably their leader. It's one of the weakest bosses in the game, but can regain HP, albeit slowly. 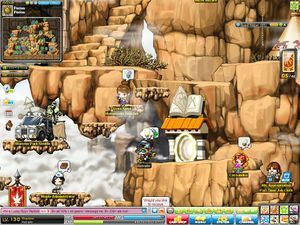 Lore: long ago, Perion used to be a heavily forested area, much like Ellinia, with many unique creatures that had special abilities. However, a disaster befell the people here and it became the arid wasteland it is today. Perion is accessible using Six Path Crossway. The Excavation team's camp near Perion. The Camp areas beyond the Perion Excavation Site are reminiscent of Castles. Perion is also near the area called the Excavation Site, and the Perion Remains. A few maps outside Perion, a trail leads to the Excavation site. Monsters called Wooden Masks and Rocky Masks walk on cranes that look like those near Kerning City. By traveling a few maps further, one reaches the Relic Excavation Camp. There are no monsters here, and it resembles a small town. Beyond the Campsite, undead monsters start to appear. Skeleton dogs and Mummy dogs roam the streets, and resurrected skeleton soldiers are seen inside hidden areas called "camps". The interior of the camps are very castle-like. The top maps are unique in that, if a player falls, he will exit his current map and return to the previous one. The strongest monsters are Commander Skeletons, which ride horses and cast poison mist attacks. These ruins are the remains of the Sharenian culture, a powerful civilization that once ruled over all of Victoria island. The last ruler of this culture, Sharen III, came into possession of the cursed object Rubian, which grants immortality at a terrible price. Eventually, the curse of the Rubian was so great that it led to the collapse of the entire Sharenian culture altogether. The Guild Quest is the Excavation Team's attempt to recover the Rubian. This page was last edited on 30 December 2018, at 04:43.